If you follow me on Twitter, Instagram or Facebook, you may have seen that we were recently on a visit to London. We try and do different things each time we are there – which is quite often for a couple of bois from north of the border. 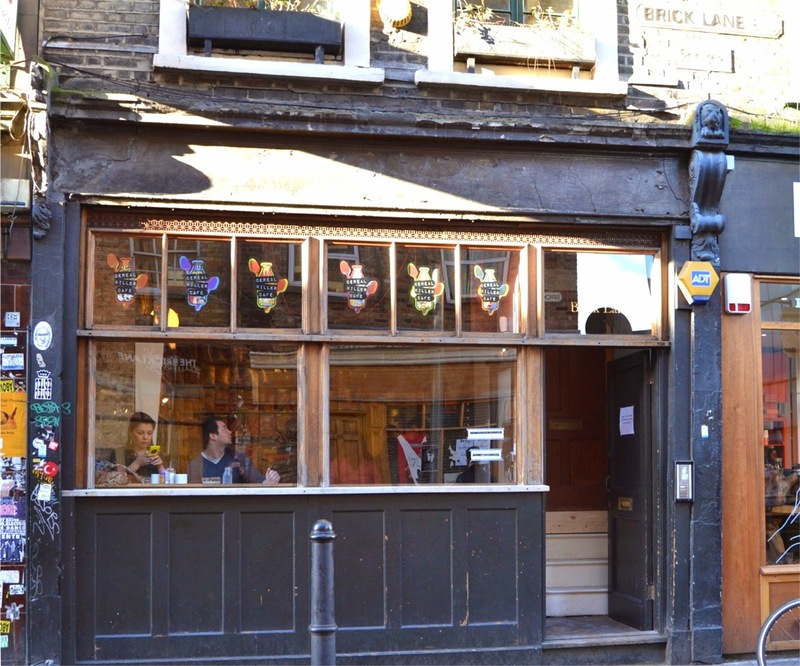 After recently reading about a new cafe which had opened up in Brick Lane, I knew it was a place I had to visit! 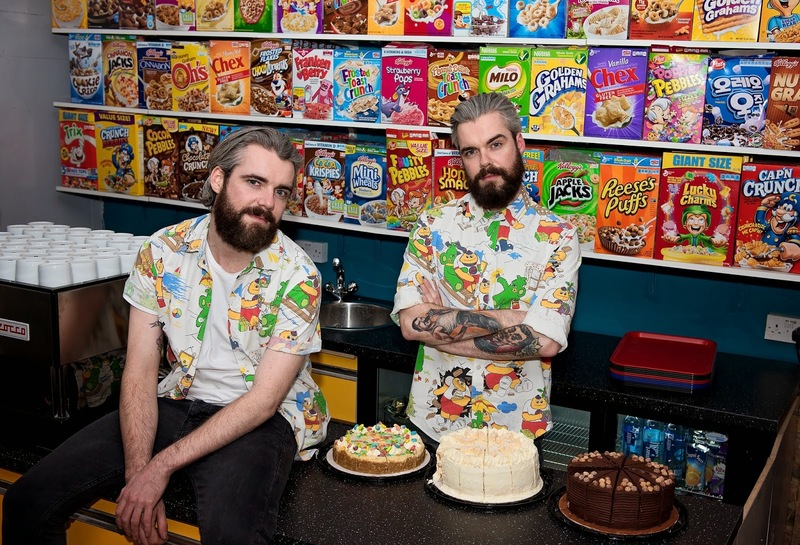 The Cereal Killer Cafe is the concept of twins Alan and Gary Keery who hail from Belfast. 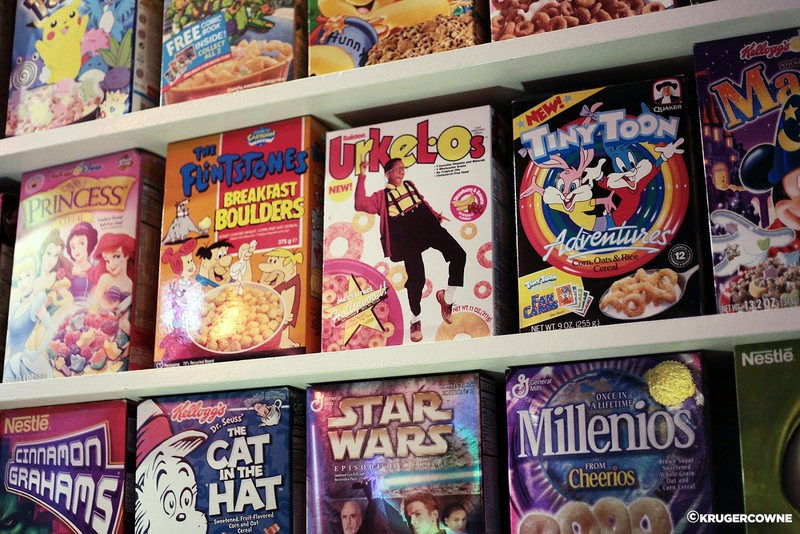 It’s the world’s first cereal themed cafe, which offers 120 types of cereal from all over the world. You can try various varieties of milk to have with your chosen cereal and if you like, different toppings such as marshmallows or M&M’s to try on top of that! I am obsessed with cereal and have been since being a wee lad. In the 70’s the first cereal I remember having was Ready Brek, before I moved on to Coco Pops in the 80’s. But I was usually swayed by the brill free gifts you used to get hidden in boxes back then, so was a bit of a cereal whore really! Then I discovered American cereals and all that changed. 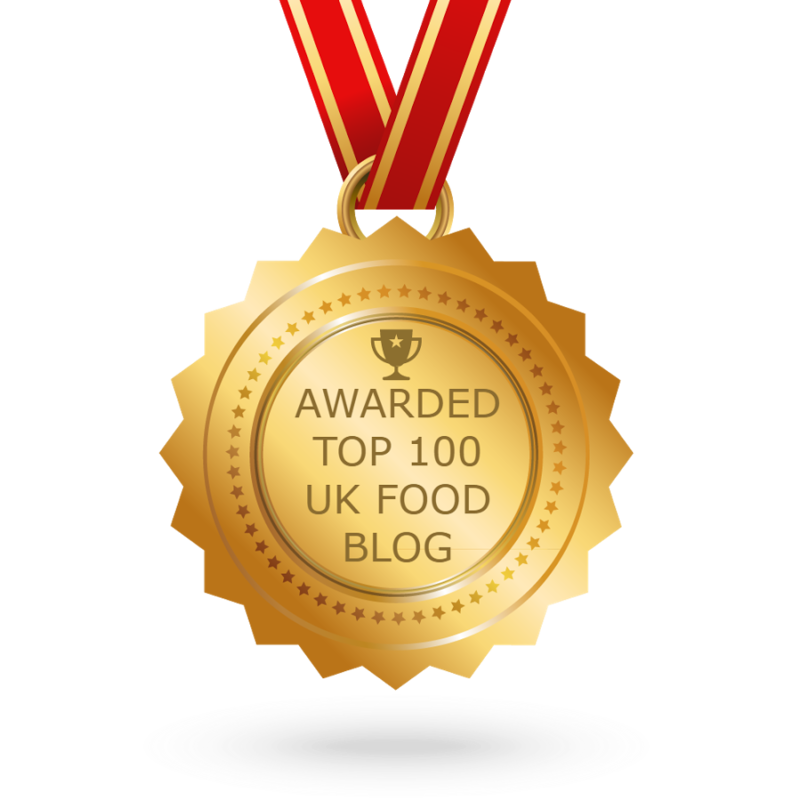 Froot Loops became my number one favourite (but NOT the yucky UK variety you get now!). Anyway, back to the cafe! Disneyboi and I located the cafe early on Friday morning. It is quite unassuming from the exterior, but once inside, that all changed. Smaller than I was expecting, the ground level comprises the counter and some seating. 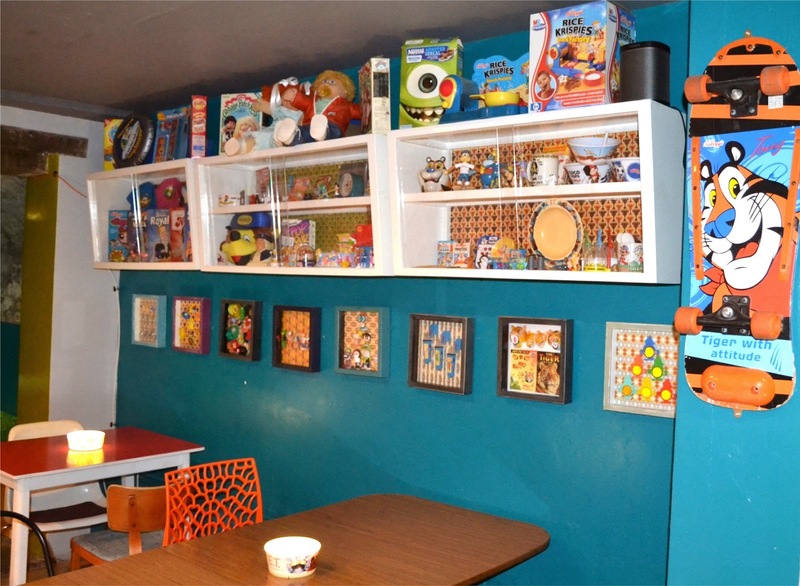 The wall behind the counter is festooned with all the boxes of cereal, and there is some cereal themed merchandise to peruse too. We ventured downstairs to the lower level of seating as the upstairs was full. We were given menus to try from, I wish I could remember everything that was on it. It was crammed full of cereals from all over the world, cereal-infused cakes and some ‘cocktails’ of cereal to try. We both went for these. Disneyboi chose an apple and cinnamon combo, which contained Apple Jacks, plus other types to make his cereal taste like a warm apple pie. I had to go for something containing Froot Loops of course. I was immediately drawn to the ‘Double Rainbow’. 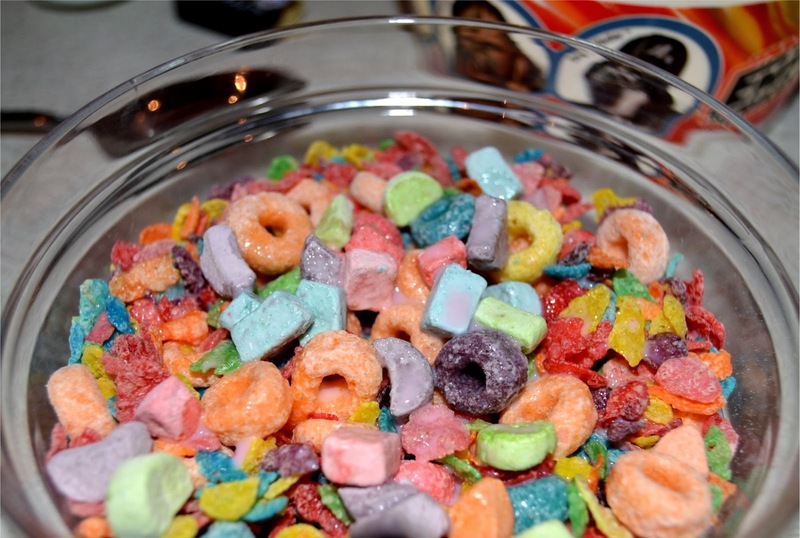 This contained, Froot Loops as I said, plus Fruity Pebbles and marshmallow pieces, served with strawberry milk. It sounded like a riot of colour, hence the name. Our cereals arrived with our freshly brewed cappuccinos and wholemeal toast. I was tempted to have a schmear of Marshmallow Fluff on mine but Disneyboi held me back! 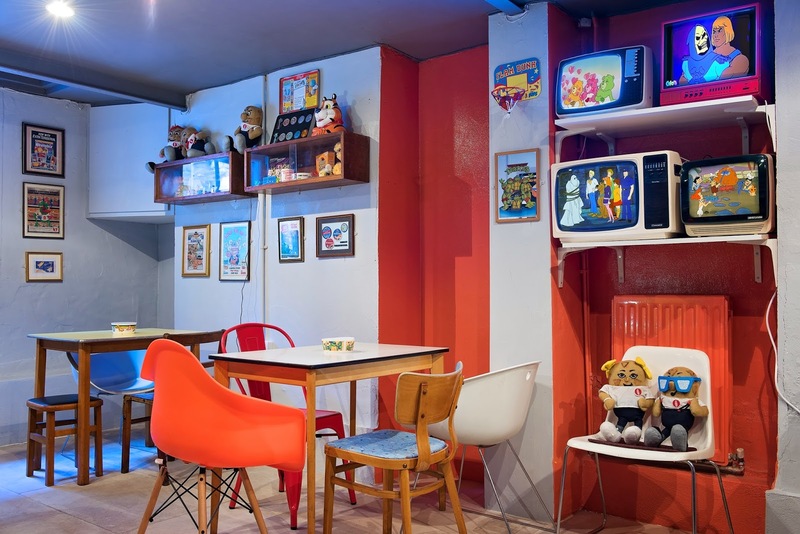 The food was as tasty as we expected and we certainly felt relaxed in the quirky, vibrant surroundings. Soon we had to leave and move on to our next stop (The Shard, great views) but when we came above ground, the cafe was heaving! It certainly is a popular place. There has been negative press about the cafe sadly. 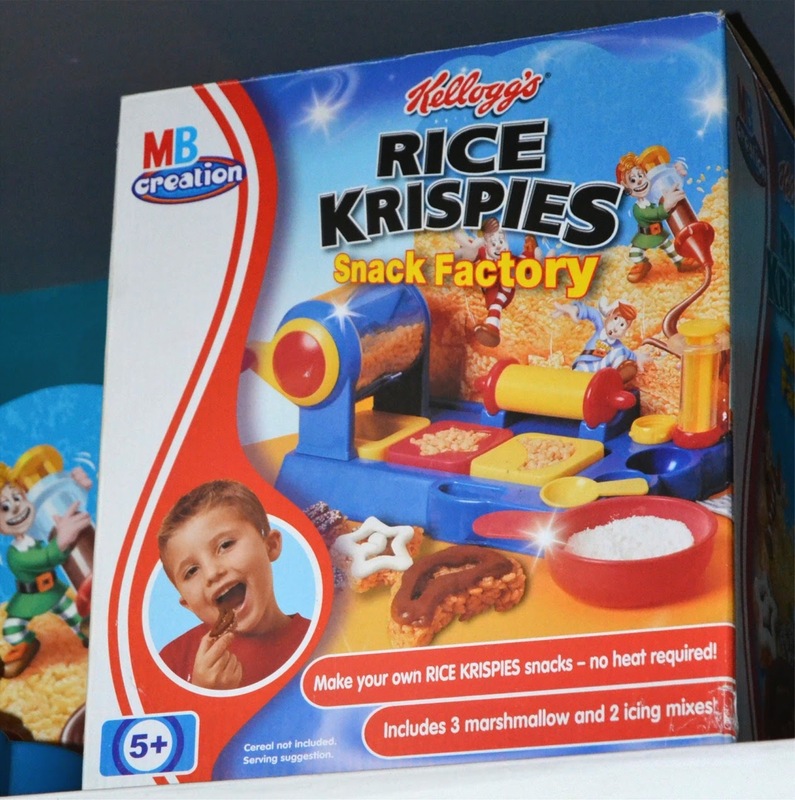 People saying that ‘overpriced’ cereal (you are paying for imported cereal and an experience) in a deprived area of the city goes against the ‘grain’. For me personally, these guys are trying to set up a new business, yes in a part of the city which isn’t affluent. We saw plenty of other shops and bars near the cafe which could be accused of the same thing. But the media hasn’t criticised them. And if it brings in new visitors to the surrounding area, that can only be a good thing? I posted a picture of my cereal on Twitter, and received quite a nasty tweet, saying that it was full of sugar and nothing natural, and who could possibly eat or sell something like that? To that woman, I say – they didn’t force me to eat it. The cafe is full of healthy cereals to eat too, but this was a treat for me. The whole experience was a trip back to my childhood. In this world, where so many horrible things are happening, to be able to escape for a wee while into a sugary land of yesteryear, celebrating happy memories is a positive experience. If you are so against it – don’t visit! I applaud the brothers on their venture. I hear they are already planning on opening up a second cafe in London and have received interest from all over the world. 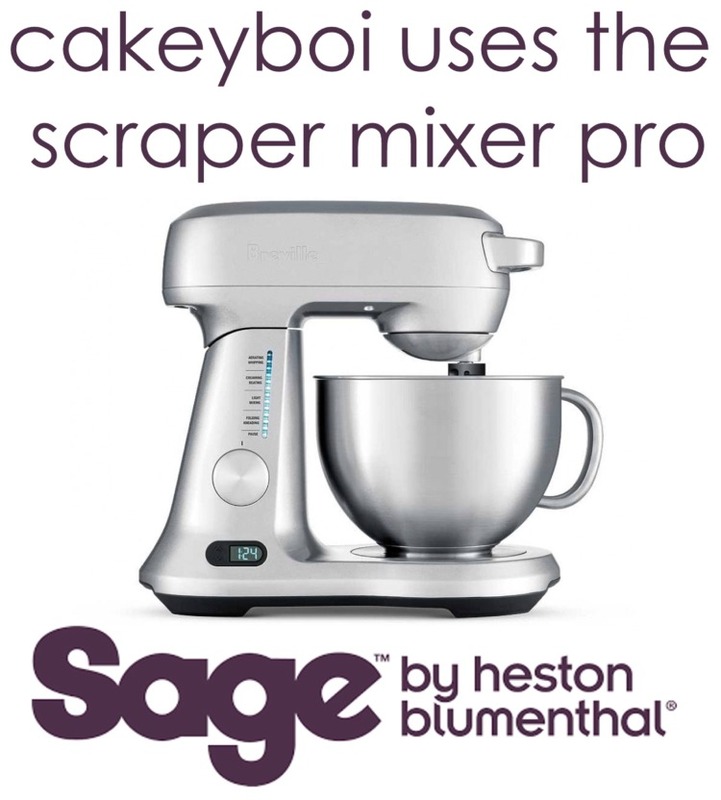 Plus a recipe book may even be in the pipeline (jealous! ), which I will definitely purchase. 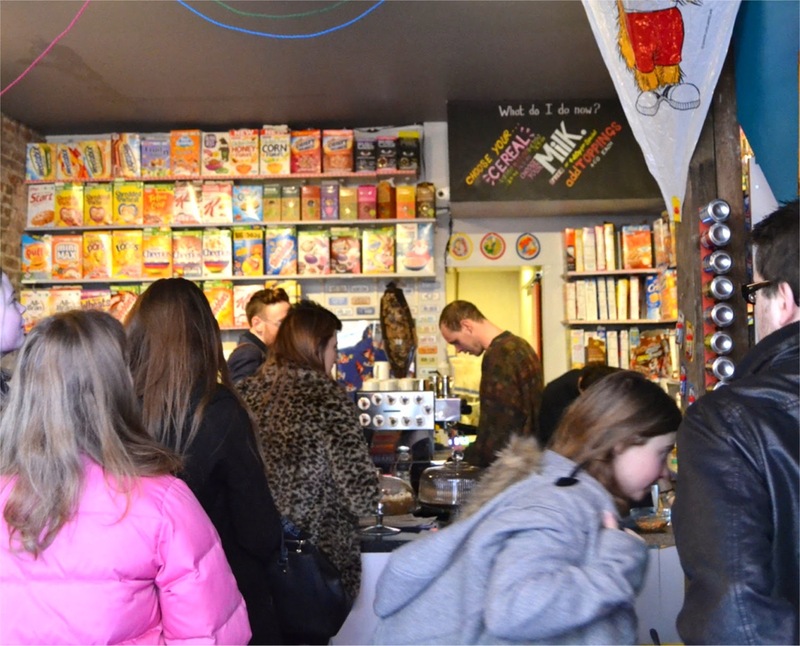 So, in summary, if you like cereal, are a bit of a grown-up kid like me and want to try a new experience, visit the Cereal Killer Cafe at 139 Brick Lane, London. 'It’s grrrrrreat', as a certain tiger would say. Disclosure Statement: I haven't been endorsed to write this post. I visited the cafe of my own volition. I did contact the cafe by email to ask for some images which they kindly provided. Some are used here, along with some of my own. Any opinions expressed are entirely my own. It looks like so much fun! I love it round that area, it seems a perfect spot for it as anything seems to go there... I for one will be paying a visit next time I'm down, and look forward to a wee trip down Memory Lane as well as Brick Lane! I heard all about that one! I read that 'bad article' and thought the person missed the point completely. It's like saying you could make steak and chips for under a tenner at home, so why pay about £20 to eat it out! Or you could have a bottle of wine at home for about the cost of a glass in a restaurant. Point missed! Good luck to them - it's quirky, fun and lord knows, we could do with a bit of fun in the world at the moment! If they are still in production I'm sure they will! That's what I thought Camilla! I've only tried Froot Loops once, in Mexico, and they were horrible!!! Maybe it was the 'yucky UK variety'! I really must take Ed here. I think he would love it. Personally I do not quite see thee point of cereal! The channel 4 numpty reporter pissed me off, a cheap attack to try and make a small fun story something he could make his name on. Luke anyone criticises the coffee shops because we can make coffee cheaper at home! Glad you had fun. I'd visit if it were near me. Thanks Kavey - it was a great experience. I'm sure the numpty reporter hasn't damaged their business thankfully! WOW! What a great place to visit! Their cakes look delicious! I think both the article and the tweet completely missed the point of this place - obviously you're not going to eat sugar packed cereal daily but it is a fun treat and a chance to try something that you can't normally get in this country in a fun environment! 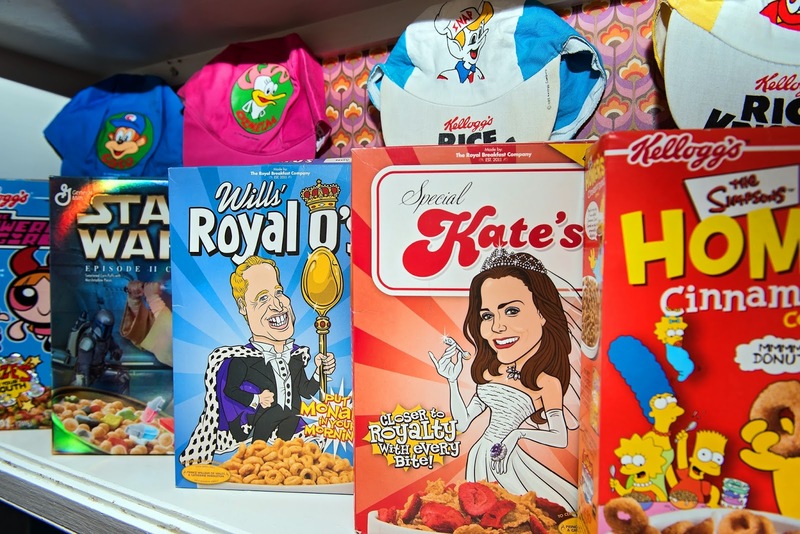 I'm a HUGE cereal fan myself - I usually have a few different boxes on my shelves (both healthy and... not so much) and I could eat cereal for any meal - it's definitely not just for breakfast! I would LOVE to visit this place someday! It looks like a fun place to visit, probably difficult to make a choice what to have! I've heard about this place. I love the line "escape for a wee while into a sugary land of yesteryear" - I'm SOLD! Detox with a Key Lime Pie (Smoothie)!